I’m very lucky to have the wonderful Schreiners Iris farm that ships all over the US right in my back yard. 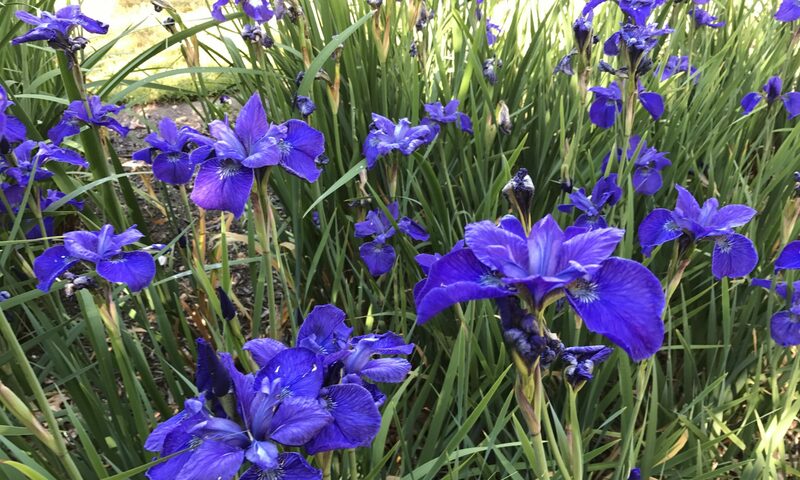 There are fields and fields of beautiful irises that you can see right from the I5 freeway. But they also have a spectacular display garden, one of the nicest I have ever seen. For the month of May they also have an Iris Festival with vendors and wine sampling, food and garden art. We usually go at least once a season and sometimes twice. Yesterday was the day. This year I made it out of there without buying any more irises, but that could change. These are a few of the photos I took of the gorgeous displays. I gotta have these two. Maybe I won’t get away without buying new Irises after all. A Peony without a name. It’s beautiful and looks a little like Bowl Of Beauty. I wonder if Edelman’s Peony Farm would know? We are going there next week. Back at home Zoe made herself very happy laying on top of the Catnip that we cut for drying. Absolutely gorgeous irises… I cannot wait for ours to bloom. They certainly are. I love going here each year to see the lovely garden. Yes, the view of the iris field is gorgeous. They are so pretty, lovely images. Have a happy day and week ahead! Thanks for coming by. Those irises are certainly beautiful. And it is so cool being able to drive down the freeway and get a glimpse of them from the road. I would be broke if I lived that close…wow! Thanks for coming by. I Am broke. But now I have so little room left that I can’t really buy many more. It all began when nurses I worked with up in Washington wanted to put together a group order for the volume bonuses. The rest is history. Now, I live only 10 miles from the Iris Farm. Danger! Thanks for stopping by. Yes, Zoe really is a cutie and a bit of a twit. Oh boy, that would be a dangerous place for me to visit. We have a daylily farm not too far that I’m afraid to go back to because I know I wouldn’t come home empty handed. Yes it really is a very dangerous place to visit. I’m sure I could find lots of danger in being close to a daylily farm as well. The irises really are stunning there. And I love visiting. We also live fairly close to a tulip farm ourselves, but the traffic gets so horrible that we have to go very early in order to get parking. This time of year we have many visits to many flower farms and love it. The irises are so lovely, and they are always coming up with more incredible color combinations. I love the orange one, so sumptuous! I haven’t been to Schreiner’s but Aitken’s Salmon Creek gardens are close to me and I used to go walk their fields but reached my quota of irises so I don’t get there as much. I should go while they are blooming. Zoe with the catnip so so funny, tripping. Thanks for coming by. We have family in Vancouver and have been to Aitkens. They are smaller than Schreiners, but equally lovely. I think I have a few of their irises in my garden as well, but I don’t remember which. If you get a chance, Schreiners is only about an hour down the freeway in Salem (actually Keizer). It is fun. As for Zoe, she really is a trip. We have to protect the catnip plant with an upside down hanging basket cage, or th catnip would be squashed. i love this post… Because of the absolute incredible beauty and your great photos AND because of the memories. We lived in Springfield for nearly 30 years, and made several trips to these beautiful gardens. (We still spend summers in Oregon, but the iris will be gone by the time we make it “home” this year. ). So thank you ever so much. Thanks for coming by. I’m so glad I could bring back memories for you. The irises and gardens are really special this time of year. Even if you don’t make it back for the irises this summer, enjoy. there are so many other lovely things to see in Oregon. Oh what a fun tour. I loved the cat enjoying a nap. The Iris’s were beautiful. Thanks for sharing. Thanks for coming by and see me too! Thanks for coming by. Glad you enjoyed the irises and my kitty. Wow!! It looks like this day was perfect. And now I need to visit again because there are irises in your post that I overlooked when I visited last. You captured some beauties here! Thanks and thanks for stopping. I love our irises. They are just some of the prettiest flowers. Glad you enjoy them. Thanks for coming by. I love visiting Schreiners and some of the other flower farms we have around. I’ll be sure to come and visit you in a little bit. Thanks and thanks for stopping. I have a lot of fun with my own and visiting other people’s irises. An Iris farm is a heavenly idea! Zoe is a cutie. Thanks and thanks for visiting. Irises are some of my favorite flowers. Beautiful! When we lived in Ft. Worth we had a lot of iris’ in our yard. I’ve missed them. This spring I planted a couple of purple ones with plans to plant more this fall. Thanks for sharing the tour! Thanks and thanks for stopping by. Good luck with your Iris planting do. They are certainly lovely flowers. They’re all gorgeous! I love irises and peonies and if I would have a bigger garden it would be full of them. I love iris! I just wish they lasted longer! 🙂 Thanks for sharing at the Thursday Favorite Things Blog Hop! Oh what a wonderful post with all these beautiful iris and peony. This was a pleasurable visit! I love Irises. You’d have to drag me away from there! We have wild irises that grow here in western Washington. I’m from the desert, so that’s just so foreign to me! Amazing though. I get so happy every time I go for a walk and see all the wildflowers around me. Thanks for linking up to the Macro Monday Mixer. Hope to see you there again this week! Lucky you! Irises are such lovely flowers. Beautiful! I never tire of seeing Iris. Mine have been gorgeous this year. Would love to tour an Iris farm! Thanks for sharing with SYC. Oh, Yael! That looks like Iris Heaven… Such a wonderful place when they are in bloom. Lovely photos. Thank you for joining Floral Friday Fotos and I hope to see your next contribution soon.